NEW SUNSPOT: Breaking a string of 11 spotless days, a new sunspot group is growing in the sun's southern hemisphere. So far the emerging dark cores are small and quiet, not crackling with flares. This is typical of solar minimum sunspots. Free: Solar flare alerts. "The flash from this extremely bright fireball on Aug. 12th surprised dozens of observers in and around the Kolonica Observatory," says Horálek. "It was so bright, the landscape lit up as if under a crescent Moon. The debris trail (inset) was visible for more than one hour after the fireball appeared in the sky. What a great Perseids peak this year!" This is a "coronal hole"--a region where the sun's magnetic field opens up and allows gaseous material to escape. 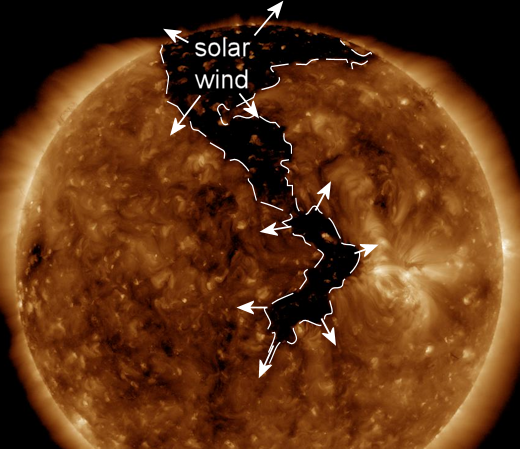 Solar wind emerging from the hole is expected to reach Earth on Aug. 16th and 17th. The incoming stream of solar wind may be preceded by a CIR (co-rotating interaction region). CIRs are transition zones between slow- and fast-moving solar wind. They often contain shock-like density gradients and strong magnetic fields that do a good job sparking auroras. And because Arctic aurora season began just a few days ago, the aurora photo gallery may soon receive some new additions. 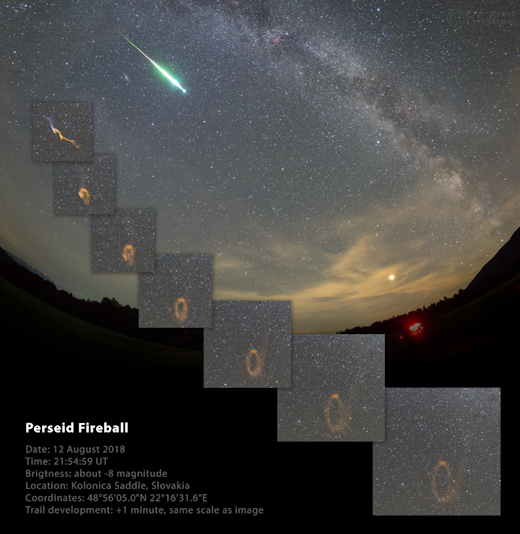 On Aug. 14, 2018, the network reported 180 fireballs. On August 14, 2018 there were 1912 potentially hazardous asteroids. SOMETHING NEW! We have developed a new predictive model of aviation radiation. It's called E-RAD--short for Empirical RADiation model. We are constantly flying radiation sensors onboard airplanes over the US and and around the world, so far collecting more than 18,000 gps-tagged radiation measurements. Using this unique dataset, we can predict the dosage on any flight over the USA with an error no worse than 15%.